^ Cosmology: The Study of the Universe. Universe 101: Big Bang Theory. NASA. 2010-12-10 [2017-04-15]. （原始内容存档于2011-05-14）. The prevailing theory about the origin and evolution of our Universe is the so-called Big Bang theory … The second section discusses the classic tests of the Big Bang theory that make it so compelling as the likely valid description of our universe. ^ Feuerbacher, B. Evidence for the Big Bang. TalkOrigins. 2006-01-25 [2010-06-11]. ^ Wright, E.L. What is the evidence for the Big Bang?. Frequently Asked Questions in Cosmology. UCLA, Division of Astronomy and Astrophysics. 2009-05-09 [2010-06-11]. ^ Planck Collaboration. Planck 2015 results. XIII. Cosmological parameters (See PDF, page 32, Table 4, Age/Gyr, last column).. Astronomy & Astrophysics. 2015, 594: A13. Bibcode:2016A&A...594A..13P. arXiv:1502.01589. doi:10.1051/0004-6361/201525830. ^ 5.0 5.1 Foundations of Big Bang Cosmology. Universe 101: Big Bang Theory. NASA. 2010-12-10 [2017-04-15]. （原始内容存档于2011-05-14）. ^ 6.0 6.1 6.2 6.3 Hubble, E. A Relation Between Distance and Radial Velocity Among Extra-Galactic Nebulae. Proceedings of the National Academy of Sciences. 1929, 15 (3): 168–73. PMC 522427. PMID 16577160. doi:10.1073/pnas.15.3.168. ^ Gibson, C.H. The First Turbulent Mixing and Combustion (PDF). IUTAM Turbulent Mixing and Combustion. 2001-01-21. ^ Gibson, C.H. Turbulence And Mixing In The Early Universe. 2001. arXiv:astro-ph/0110012 [astro-ph]. ^ Gibson, C.H. The First Turbulent Combustion. 2005. arXiv:astro-ph/0501416 [astro-ph]. ^ 'Big bang' astronomer dies. BBC News. 2001-08-22 [2010-06-15]. ^ Croswell, K. Chapter 9. The Alchemy of the Heavens. Anchor Books. 1995. ^ Mitton, S. Fred Hoyle: A Life in Science. Aurum Press. 2005: 127. ^ Slipher, V.M. The Radial Velocity of the Andromeda Nebula. Lowell Observatory Bulletin: 56–57. ^ Slipher, V.M. Spectrographic Observations of Nebulae. Popular Astronomy: 21–24. ^ Lemaître, G. The Evolution of the Universe: Discussion. Nature. 1931, 128: 699–701. doi:10.1038/128704a0. ^ Christianson, E. Edwin Hubble: Mariner of the Nebulae. New York（NY）: Farrar, Straus and Giroux. 1995. ISBN 0374146608. ^ 19.0 19.1 19.2 Peebles, P.J.E. ; Ratra, Bharat. The Cosmological Constant and Dark Energy. Reviews of Modern Physics. 2003, 75: 559–606. doi:10.1103/RevModPhys.75.559. arXiv:astro-ph/0207347. ^ Milne, E.A. Relativity, Gravitation and World Structure. Oxford（UK）: Oxford University Press. 1935. LCCN 35-19093. ^ Tolman, R.C. Relativity, Thermodynamics, and Cosmology. Oxford（UK）: Clarendon Press. 1934. LCCN 34-32023. Reissued (1987). New York (NY): Dover Publications ISBN 978-0-486-65383-9. ^ Alpher, R.A.; Bethe, H.; Gamow, G. The Origin of Chemical Elements. Physical Review. 1948, 73: 803. doi:10.1103/PhysRev.73.803. ^ Alpher, R.A. Evolution of the Universe. Nature. 1948, 162: 774. doi:10.1045/march2004-featured.collection. ^ Hoyle, F. A New Model for the Expanding Universe. Monthly Notices of the Royal Astronomical Society. 1948, 108: 372. ^ Mitton. Fred Hoyle: A Life in Science. Cambridge University Press. ISBN 978-1-139-49595-0. "To create a picture in the mind of the listener, Hoyle had likened the explosive theory of the universe's origin to a 'big bang'"
^ 27.0 27.1 Penzias, A.A.; Wilson, R. W. A Measurement of Excess Antenna Temperature at 4080 Mc/s. Astrophysical Journal. 1965, 142: 419. doi:10.1086/148307. ^ 32.0 32.1 32.2 32.3 32.4 32.5 32.6 Barbara Sue Ryden. Introduction to cosmology. Addison-Wesley. 2003. ISBN 978-0-8053-8912-8. ^ 33.0 33.1 33.2 33.3 Guth, A.H. The Inflationary Universe: Quest for a New Theory of Cosmic Origins. Vintage Books. 1998. ISBN 978-0099959502. ^ 34.0 34.1 34.2 34.3 34.4 34.5 34.6 34.7 34.8 34.9 Edward W. Kolb; Michael S. Turner. 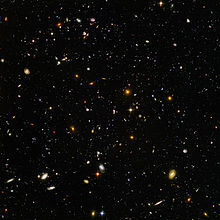 The Early Universe. Addison–Wesley. 1988. ISBN 0-201-11604-9. ^ 35.0 35.1 Peacock, John. Cosmological Physics. Cambridge University Press. 1999. ISBN 0521422701. ^ C. L. Bennett. Nine-Year Wilkinson Microwave Anisotropy Probe (WMAP) Observations: Final Maps and Results. The Astrophysical Journal Supplement. 2013, 208 (2): 20. Bibcode:2013ApJS..208...20B. arXiv:1212.5225. doi:10.1088/0067-0049/208/2/20. ^ Gordon Fraser. The New Physics: For the Twenty-First Century. Cambridge University Press. 2006-02-13. ISBN 978-0-521-81600-7. ^ Stephen W. Hawking. The Theory of Everything: The Origin and Fate of the Universe. Jaico Publishing House. 2007-01-01. ISBN 978-8179925911. ^ Ivanchik, A.V. The Fine-Structure Constant: A New Observational Limit on Its Cosmological Variation and Some Theoretical Consequences. Astronomy and Astrophysics. 1999, 343: 459. ^ Goodman, J. Geocentrism Reexamined. Physical Review D. 1995, 52: 1821. doi:10.1103/PhysRevD.52.1821. ^ d'Inverno, R. Chapter 23. Introducing Einstein's Relativity. Oxford（UK）: Oxford University Press. 1992. ISBN 0-19-859686-3. ^ Smoot, G. F. Cosmic Microwave Background Radiation Anisotropies: Their Discovery and Utilization　. Nobel Lecture. Nobel Foundation. 2006 [2008-12-22]. ^ The Nobel Prize in Physics 1978. Nobel Foundation. [2008-10-09]. ^ The Nobel Prize in Physics 2006 (新闻稿). The Royal Swedish Academy of Sciences. 2006-10-03 [2015-05-15]. ^ A. Melchiorri et. al. A measurement of Omega from the North American test flight of BOOMERANG. Astrophys.J (Institute of Physics). 1999年11月, (536) [2015-05-15]. ^ Naeye, Robert. WMAP Reveals Neutrinos, End of Dark Ages, First Second of Universe. Goddard Space Flight Center. 2008. ^ Wollack, Edward. Links to Other CMB Experiments. WMAP. NASA. 2015. ^ Steigman, G. Primordial Nucleosynthesis: Successes And Challenges. 2005. arXiv:astro-ph/0511534. ^ Bertschinger, E. Cosmological Perturbation Theory and Structure Formation. 2001. arXiv:astro-ph/0101009. ^ Bertschinger, E. Simulations of Structure Formation in the Universe. Annual Review of Astronomy and Astrophysics. 1998, 36: 599–654. doi:10.1146/annurev.astro.36.1.599. ^ Perley, D. Determination of the Universe's Age, to. University of California Berkeley, Astronomy Department. 2005-02-21 [2012-01-27]. ^ Srianand, R.; Noterdaeme, P.; Ledoux, C.; Petitjean, P. First detection of CO in a high-redshift damped Lyman-α system. Astronomy and Astrophysics. 2008, 482 (3): L39. Bibcode:2008A&A...482L..39S. doi:10.1051/0004-6361:200809727. ^ Avgoustidis, A.; Luzzi, G.; Martins, C. J. A. P.; Monteiro, A. M. R. V. L. Constraints on the CMB temperature-redshift dependence from SZ and distance measurements. 2011. arXiv:1112.1862v1 [astro-ph.CO]. ^ Belusevic, R. Relativity, Astrophysics and Cosmology. Wiley-VCH. 2008: 16. ISBN 3-527-40764-2. ^ Eleftherios Papantonopoulos. The Physics of the Early Universe. Springer Science & Business Media. 2005-01-07. ISBN 978-3-540-22712-0. 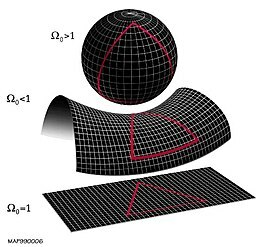 ^ Penrose, R. Singularities and Time-Asymmetry. (编) Hawking, S.W. (ed); Israel, W.（ed）. General Relativity: An Einstein Centenary Survey. Cambridge University Press: 581–638. 1979. ^ Penrose, R. Difficulties with Inflationary Cosmology. (编) Fergus, E.J.（ed）. Proceedings of the 14th Texas Symposium on Relativistic Astrophysics. New York Academy of Sciences: 249–264. 1989. doi:10.1111/j.1749-6632.1989.tb50513.x. ^ Navabi, A.A.; Riazi, Nematollah. Is the Age Problem Resolved?. Journal of Astrophysics and Astronomy. 2003, 24: 3. doi:10.1007/BF03012187. ^ Keel, B. Dark Matter. [2010-06-18]. ^ Dmitriĭ Sergeevich Gorbunov; V. A. Rubakov. Introduction to the Theory of the Early Universe: Hot Big Bang Theory. World Scientific. 2011. ISBN 978-981-4343-97-8. ^ Spergel, D. N. The dark side of the cosmology: dark matter and dark energy. Science. 2015, 347 (6226): 1100–1102. doi:10.1126/science.aaa0980. ^ Griswold, Britt. What is the Ultimate Fate of the Universe?. Universe 101 Big Bang Theory. NASA. 2012. ^ Fred C. Adams and Gregory Laughlin. A dying universe: the long-term fate and evolution of astrophysical objects. Reviews of Modern Physics. 1997, 69 (2): 337–372. Bibcode:1997RvMP...69..337A. 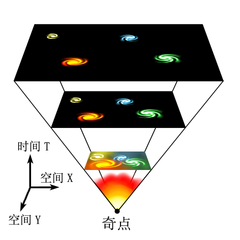 arXiv:astro-ph/9701131. doi:10.1103/RevModPhys.69.337. .
^ Caldwell, R.R; Kamionkowski, Marc; Weinberg, Nevin N. Phantom Energy and Cosmic Doomsday. Physical Review Letters. 2003, 91: 071301. doi:10.1103/PhysRevLett.91.071301. arXiv:astro-ph/0302506. ^ Hartle, J.H. ; Hawking, S. Wave Function of the Universe. Physical Review D. 1983, 28: 2960. doi:10.1103/PhysRevD.28.2960. ^ Langlois, D. Brane Cosmology: An Introduction. 2002. arXiv:hep-th/0209261. ^ Linde, A. Inflationary Theory versus Ekpyrotic/Cyclic Scenario. 2002. arXiv:hep-th/0205259. ^ Than, K. Recycled Universe: Theory Could Solve Cosmic Mystery. Space.com. 2006 [2010-06-18]. ^ Linde, A. Eternal Chaotic Inflation. Modern Physics Letters. 1986, A1: 81. ^ Linde, A. Eternally Existing Self-Reproducing Chaotic Inflationary Universe. Physics Letters B. 1986, 175: 395–400. doi:10.1016/0370-2693(86)90611-8. ^ Khoury1, J.; Ovrut, B. A.; Seiberg, N.; Steinhardt, P. J.; Turok, N. From big crunch to big bang. Physical Review D. 2002, 65 (8): 086007. doi:10.1103/PhysRevD.65.086007. ^ Kragh, H. Cosmology and Controversy. Princeton（NJ）: 普林斯顿大学出版社. 1996. ISBN 0-691-02623-8. ^ Ferris, Timothy. Coming of age in the Milky Way. Morrow. 1988: 274, 438. ISBN 9780688058890. ，引用了 Berger, André. The Big bang and Georges Lemaître: proceedings of a symposium in honour of G. Lemaître fifty years after his initiation of big-bang cosmology, Louvainla-Neuve, Belgium, 10-13 October 1983. D. Reidel Pub. Co. 1984: 387. ISBN 9789027718488. ^ Wright, E.L. Cosmology and Religion. Ned Wright's Cosmology Tutorial. 2009-05-24 [2010-06-18].